Baltimore County, located in the northern portion of Maryland is part of the Baltimore-Washington Metropolitan Area. Baltimore County lies between the Piedmont plateau and in the southern region, the Atlantic coastal plain. This makes up the majority of Baltimore County, which is characterized as suburban. Northern Baltimore County is described as primarily rural. This is because of its vast landscape of rolling hills and deciduous forest attributes. Derived from the barony of the Proprietor of the colony of Maryland, Caecilius Calvert, 2nd Baron Baltimore, in county Langford, Ireland, Baltimore County Maryland surrounds Baltimore City which left the county in 1851 to become its own city. Primarily suburban in make-up, Northern Baltimore County is chiefly rural which can be a large draw for buyers looking for an outland feel while still providing a quick commute for city workers. Located off the I-795 corridor of Baltimore County the Owings Mills\ Reisterstown area is quickly becoming a popular choice for buyers in the Baltimore Metropolitan area. I-795 along with the Maryland Transit Administration’s subway system gives residents convent access to Baltimore City and its entertainment offerings. Two of Maryland’s premier private schools McDonough School & Garrison Forest School, call the area home helping to bolster the county’s already strong public school system. Many notable residents call the area home like Peter Angelos owner of the Baltimore Orioles, and T.V. host Mike Row. There are several major interstate highways that run through Baltimore County, I-95, I-83, I-195, I-695, I-795, & I-70. Within Baltimore County, the Maryland Transit Administration (MTA) operates three rail systems; one light rail, one raid transit (Metro Subway), and one commuter rail (MARC Train). The Metro Subway runs northwest of the city to Owings Mills. The Light Rail runs north of the city to Hunt Valley and south of the city through Baltimore Highlands with some routes terminating at the Baltimore/Washington International Thurgood Marshall Airport (BWI). Also, the MTA serves Baltimore County with local and regional bus services. 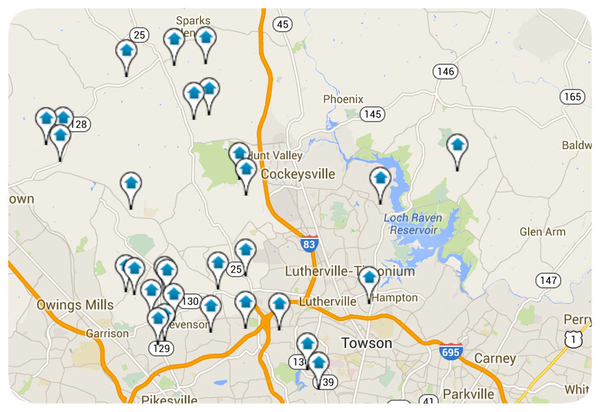 Baltimore County contains 21 private schools at the K-12 grade levels. Listed in alphabetical order are the 21 private schools; Arlington Baptist High School, Baltimore Actors Theatre Consevatory, Baltimore Lutheran School, Beth Tfiloh Dahan Community School, The Boys’ Latin School of Maryland, Calvert Hall College High School, Cambridge School of Baltimore, Garrison Forest School, Loyola Blakefield, Maryvale Preparatory School, McDonogh School, Mount de Sales Academy, Nortre Dame Preparatory School, Oldfields School, Our Lady Of Grace School, Our Lady of Mt. Carmel, The Park School, Ruxton Country School, St. James Academy in Monkton, St. Paul’s Schools, and St. Timothy’s School. Baltimore County contains six institutions of higher Learning. The University System of Maryland maintains two universities, Towson University and University of Maryland Baltimore County located in Catonsville. The two private colleges in Baltimore County are, Goucher College in Towson and Stevenson University with a campus in Stevenson and Owings Mills. Loyola College with a campus in Hunt Valley and Baltimore and the Community College of Baltimore County with campuses in Catonsville, Essex, and Dundalk are also housed within Baltimore County. For more information regarding Baltimore County real estate, please Contact Us for immediate assistance.